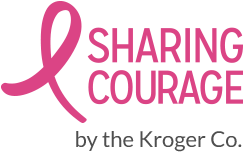 From now until October 24, your neighborhood Ralphs & Food 4 Less will donate a portion of the proceeds from selected items to Susan G. Komen Los Angeles County. Just look for the Sharing Courage hang-tags across all aisles to help you find participating products that support our mission. For more information visit your favorite Ralphs & Food 4 Less and Join the Discussion online at www.sharingcourage.com.